We see a lot of rotator cuff injuries in serious traffic collision cases. Every single body part is vulnerable in a car accident. The shoulder is particularly at risk because the balls of our upper arms are bigger than the shoulder socket that holds the ball. Your rotator cuff is the muscles and tendons in your shoulder. Trauma readily causes damage to these muscles or tendons. Causes of a rotator cuff injury may include falling, lifting and repetitive arm activities — especially those done overhead, such as throwing a baseball or placing items on overhead shelves. 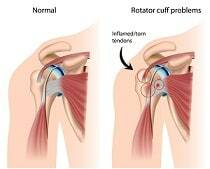 The rotator cuff is essentially a cuff of tissue. It is firm, gristly tissue that covers and attaches to the ball and socket of the shoulder joint. It consists of a group of muscles, tendons, and ligaments that control the shoulder's mobility and stabilize the ball of the shoulder within the shoulder joint. The rotator cuff is made up of four muscles and tendons. These combined to form a “cuff” over the upper end of the arm. The four muscles that make up the rotator cuff - the supraspinatus, infraspinatus, subscapularis, and teres minor - originate from the scapula, and form a single tendon unit. The rotator cuff is attached to the shoulder blade and then inserted to the upper part of the humerus. The function of the rotator cuff is to hold the shoulder joint together and hold the ball of the humerus snug in the socket while large muscles move the arm around in space. The supraspinatus tendon is the tendon that is most commonly torn when people suffer a rotator cuff tear. As defense lawyers are quick to point out, rotator cuff tendons, just like lots of our other joints and tendons, tend to degenerate as we age. $140,000 median settlement/verdict in Washington D.C. If untreated by surgery, a rotator cuff tear will not heal in the sense that the tear will eventually mend itself. A rotator cuff tear will remain a tear for the remainder of the individual's life unless surgical action is taken. If you are a lawyer working on a settlement or getting ready for trial, you want to remember to point out to the insurance company or jury that one of the real harms and losses is the surgery itself. It is painful and it comes with risks. The risks associated with rotator cuff surgery include death, infection, nerve or vessel injury, inability to repair the rotator cuff, continued pain, and arthritis. There is also no guarantee of function or abilities after surgery. This is a part of the claim that often gets overlooked. Here are a few sample settlements verdicts in these cases around the country. Some of them are rotator cuff cases our law firm handled. Clearly, this is not a scientific sampling and may not reflect the value of your case even if the facts are similar. But they are interesting, and they might give you some idea of how other similar claims have been valued and how you better expect the settlement ranges in your case. 2018, Connecticut $41,612 Verdict: A 25-year old student was a passenger in a car accident caused by the defendant when he ran a stop sign and struck her vehicle in the front right side. Plaintiff suffered a left rotator cuff tear resulting in 3% permanent partial disability. Liability was admitted and the case went forward on the issue of damages. After a bench trial, the plaintiff was awarded $41,612 for her injuries. 2017, New Jersey $100,000 Settlement: A 56-year old plaintiff driver claimed that defendant carelessly crossed over the center line causing a head-on collision. As a result of the accident, plaintiff suffered a torn left rotator cuff that required surgery to repair. He also suffered a broken left ankle and claimed to have a herniated disc. The case settled for policy limits of $100,000. 2017, Florida $181,337 Verdict: The defendant rear-ended the plaintiff on a two-lane road in Escambia County, Florida. Plaintiff was subsequently diagnosed with a tear of the right rotator cuff which he claimed was the result of the car accident with the defendant. Liability was admitted and the case went to trial solely on damages. There was no dispute that plaintiff’s rotator cuff was torn but the defense claimed that the force of accident was not enough to have caused the injury. The jury was not persuaded and awarded plaintiff’s $181,337 in damages which included $81k for past medical expenses – despite finding that his injuries were not permanent. 2016, Maryland: $250,000 Settlement: A Miller & Zois client is traveling on Route 97 North in Anne Arundel in the far left lane. She stops her vehicle and is rear-ended. She has surgery to repair her shoulder and has a quality recovery. GEICO offered their $50,000 limits, and Erie paid $200,000 in uninsured motorist coverage. 2013, Michigan: $65,000 Verdict: Plaintiff is injured when his car is rear-ended. Plaintiff claims that he suffered a rotator cuff tear and undergoes surgery. Plaintiff files suit against the uninsured driver and his uninsured motorist carrier, Auto-Owners Insurance Company. Defendants contend that the accident was the fault of the Plaintiff for slamming on his brakes for no reason. Plaintiff denies the contention, and a jury awards him $65,000. 2012, Maryland: $340,000 Verdict. The victim suffered a rotator cuff injury in a classic left turn case. Like most shoulder injuries cases, this man also had other as well, including a disc injury. Defendant made no offer to resolve the case before trial. 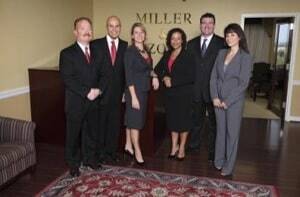 Miller & Zois handled this case. 2012, Maryland: $50,000 Settlement. Plaintiff is traveling on Washington Boulevard on a motorcycle in Baltimore City. The Defendant takes a left turn in front of him. He is diagnosed with a torn rotator cuff and had two surgeries. The Plaintiff, an engineer and a great guy, would have had a much larger recovery. But, as in many of these motorcycle cases, he had not uninsured motorist coverage and the defendant had no assets and a $50,000 liability policy. 2012, Georgia. $56,552 Verdict: Plaintiff, a homemaker, is rear-ended on an interstate exit ramp. She initially claims lower back pain, and two weeks after the accident, she begins to complain of shoulder pain. She is diagnosed with a torn labrum in her right shoulder and undergoes surgery. After continued shoulder complaints over the next nine months, she undergoes two more surgeries on the same shoulder for rotator cuff repairs. She additionally undergoes lumbar surgery for aggravation of spinal stenosis. She files suit claiming over $200,000 in medical bills and asks for $750,000 in economic and non-economic damages. The Defendant, insured with GuideOne, admits liability but disputes any injuries beyond the initial shoulder claim. The jury apparently sides with the defense and awards the Plaintiff $56,552. 2011, Pennsylvania. $47,500: Plaintiff, a 64-year-old woman is lying in bed when, if you can imagine, the Defendant’s vehicle crashes into the wall of her house, knocking her out of bed. She strikes her shoulder against the wall. The Defendant is arrested for DUI, and Plaintiff is diagnosed with a rotator cuff tear. Plaintiff undergoes surgery. Records show that the Plaintiff previously underwent rotator cuff repair surgery, 15 years before the subject collision. The defense contends that the Plaintiff suffers from unrelated health issues, including circulatory problems and as knee condition, limiting her mobility and her rotator cuff injury was not acute by chronic. The case settles the day before trial for $47,500. 2010, Florida. $500,000 Verdict: Plaintiff, 34, is working as a landscaper, blowing grass to the shoulder of the road when he is struck by a vehicle. Plaintiff is diagnosed with a rotator cuff tear and aggravation of a pre-existing lumbar disc herniation. Plaintiff undergoes shoulder surgery and lumbar surgery. The defense maintains that Plaintiff caused the collision by stepping into the path of the oncoming vehicle and that the Plaintiff did not sustain a permanent injury. Plaintiff returns to employment, but in a limited capacity with a different employer. He claims that his accident-related injuries diminished his future earning capacity. The defense emphasizes his accident history that includes four prior accidents and a visit to his orthopedic surgeon four days before the accident. The jury finds that the Plaintiff suffered a permanent injury as a result of this crash, but found the Plaintiff to be 40% comparatively negligent. The Plaintiff is awarded $500,000 in damages, that is reduced to a net of $300,000. Our lawyers are experienced in handling rotator cuff injury cases. If you have a rotator cuff injury that you suffered in a motor vehicle collision in Maryland or Washington D.C., call us at 800-553-8082 or get a free online consultation.